Agrarian Policy and Food Minister of Ukraine Taras Kutoviy has said that he is resigning from his ministerial position and asked lawmakers to support his decision. "A minister's choice to resign is an absolutely natural process for any European country and a usual international practice. I am leaving with gratitude for the trust bestowed upon me by all agrarians, people's deputies from the coalition and the Petro Poroshenko Bloc faction, members of the agrarian committee, President Petro Poroshenko, Prime Minister Volodymyr Groysman, the UDAR group and personally [Kyiv Mayor] Vitali Klitschko," Kutoviy wrote on his Facebook page on Tuesday evening. Kutoviy noted that the fifth year of his work in the political arena is coming to an end and he shared his plans for the future. "I think that I have enough knowledge, energy and strength to do even more for Ukraine. And soon I plan to focus on the matters of attracting investments in the Ukrainian economy," he wrote. 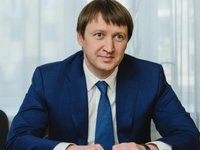 As reported, in 2004-2009, Kutoviy was financial director of the CJSC 'XXI Century Investment company", in 2010-2011, he was the president of PJSC "Rise" Company. Since December 2014, he headed the Verkhovna Rada Committee on Agrarian Policy and Land Relations, was deputy head of the Petro Poroshenko Bloc parliamentary faction. April 14, 2016, was appointed minister of agrarian policy and food of Ukraine in the government of Volodymyr Groysman.